Mid-April to Mid-Nov. Open Tues. to Sat. 9am-6pm. Closed Sun - Mon. Open 7 days a week in May. The team at Stockmen's, invite you to take a tour of our Garden Center. 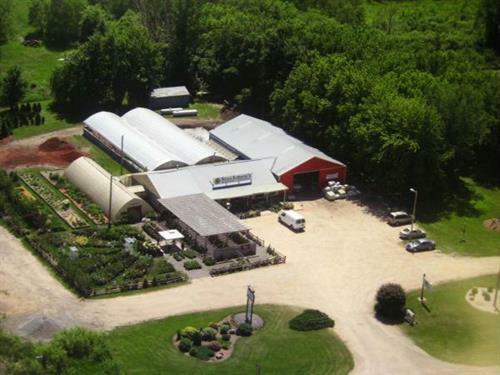 With over six thousand square feet of growing space under cover and the aid of the most knowledgeable and experienced group of employees in Meeker County your springtime beautification projects become a true one stop shopping experience. With hundreds of hanging baskets and thousands of individual plants from which to choose you can be assured of finding just the right combination of colors and textures to make your home a showplace! Stockmen's takes pride in growing their own plants. This means they are ready for the inconsistencies of Minnesota's weather and will provide you with an entire summer of color with a minimum of maintenance. If perennials are your thing, you will be pleased with the wide selection of the latest varieties from daylilies to hosta to grasses to sedum and much, much more. Plus we will provide expert instruction on their care and feeding! Located approximately 1 mile west of Litchfield on highway 12 at its intersection with highway 22.